By converting the kinetic energy of the impact load into heat Damptech dampers absorb the impact of a moving load, or blast load, and thereby reduce the transmission of potentially damaging shocks to equipment and vehicles. Damptech Impact Dampers dissipate the energy uniformly when a moving load impacts against a resisting force like a wall or a barrier. The damper in its initial position is elongated. When a moving load hits the damper the damper resists the movement by gradually closing until the moving load is stopped. In doing so the damper has converted the mechanical energy of the moving load into heat and damage is avoided. The latest novelty of DAMPTECH named Friction-ViscoElastic Damper Device (F-VEDD) combines the advantages of pure frictional and viscoelastic mechanisms of energy dissipation. This new product consists of friction pads and viscoelasic polymer pads separated by steel plates as shown below. A prestressed bolt in combination with disc springs and hardened washers is used for maintaining the required clamping force on the interfaces as in the original FDD concept. A building or facility may experience windstorms and earthquakes of different magnitude during its service life. A structure equipped with F-VEDDs will respond favourably to wind-induced forces and small quakes, when the viscoelastic pads will be only active, but will also remain safe in major quakes, when the powerful action of the frictional components will get mobilized. Intensive testing is currently underway with different viscoelastic materials supplied by international companies. The efficiency of the new device is experimentally confirmed as shown on the sample plot for small and large amplitudes of rotation and moment. Detailed information may be made available upon request. Light framed timber residential buildings are widespread in many parts of the world including USA, Canada, Japan, Australia and New Zealand. This type of construction ranges from single story to three stories and the seismic forces are usually resisted by steel or timber bracing and plywood-sheathed walls. The trends of modern architecture place ever-higher demand for flexible floor planning and large open spaces which in turn may lead to solutions that are not acceptable by the seismic design codes. Recent destructive earthquakes have shown that despite of the relatively low life loss in houses of woodframe construction, the timber buildings did not perform well in terms of damage. According to Kircher et al. ("Earthquake Spectra, EERI, 1997), in the 1994 Northridge (California) Earthquake the property loss to woodframe costruction was estimated to kr137.06 billion. The social impact was also tremendous, due to the temporary or long-term displacement of thousands of residents. Our devices will reduce the lateral drift and damage to woodframe buildings and allow the structural designer to create an earthquake-resistive structure without adhering to the special detailing rules for the timber joints, fasteners and sheathing. 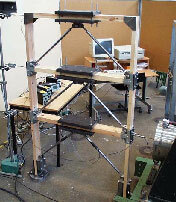 Research is currently underway to demonstrate the increased margin of safety of timber frames with friction dampers in destructive earthquakes. Low-rise does not always mean safe. The main reason for the poor behavior and extensive damage under earthquake loading was the inadequate bracing, particularly in older timber construction. 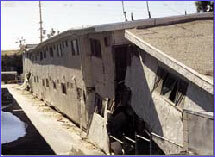 In most cases of collapsed or heavily damaged houses the large openings in the ground floor were responsible for producing weak story and large deformations. The innovative approach of DAMPTECH has driven us to various solutions to the problem. 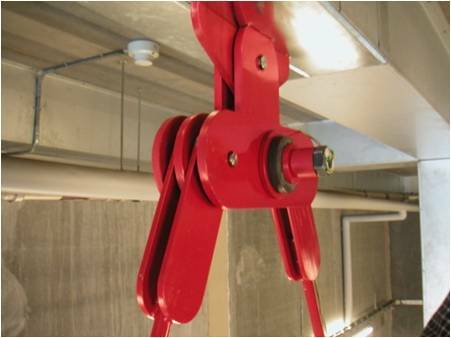 A friction damper device can be easily incorporated into a prefabricated wall panel or placed along the column lines of a warehouse building instead of conventional bracing.